In this paper, we give detailed information about development of microprocessor based automatic gate. In common gate operations many times troubles will occur, using microprocessor based automatic gate, we can completely remove these troubles easily. We are going to use this automatic gate in Automatic Car Parking. The automatic gate senses vehicle which they come near to it. It automatically opens, wait for a definite time, and closes after the time has passed. This system can also regularly check the number of vehicle that entered the parking area and calculate the available space limit of the area. The automatic gate developed in this paper is controlled by software, which can be modified any time whenever the system needs the change. Keywords: automatic gate, microprocessor, automobile, traffic controllers. Need of automatic gate is rapidly increasing day by day. This system described the use of microprocessor as a controller. This automatic gate is nothing but the alternative of manual gate. Manual systems are costly, time consuming. Micro controlled gate are used in making sound system, Robot, automatic breaking system, etc. This automatic gate can be used in parking of residential home, organization, in public car parking. This system consists of an automatic remote control to open and close the door for parking. It opens the door only when the space is there. The automatic gate which is used here is not for security purpose. It is just developed to eliminate the problems which are faced by the older manual method. The system presented here is microprocessor based automatic gate. Here microprocessor is used to control the sensor which gives the information about space limit. This system opens, wait and closes door for car. And counts the number of car entered or exit. This system consists of trigger circuit, sensor, CPU and memory module, display, gate and power supply unit. First sensor gives input signal to system. The sensor is optical when the car cross it then the signal is HIGH otherwise it is LOW. Trigger is responsible for the HIGH and LOW signals. This trigger coverts the analog signal to digital. If the signal is HIGH then trigger sends the signal to interface unit. Then the car enters the parking. If the signal is LOW then the car never enters to the parking area. Power supply unit supplies DC voltage for system. It is an optical sensor; this is the light dependent register. This will change its resistance with intensity of light. In this system we use ORP12 it is called as dark resistance of 10Ω. When light ray are focused then resistance is low and if lights are disturbed, resistance will start increasing to dark resistance. Two pair of resister is used one for entrance gate and another for exit gate. Sensor unit send output to trigger circuit. When light ray focused output voltage is v01 and v02. And when light is getting interrupted then the voltage increases to 5v. This is made up of trigger, two input NAND gate. This receives the output from sensor unit. If there is output from sensor unit then only trigger circuit go HIGH, otherwise it remains at LOW level. Clock circuit: Crystal Oscillator is used to implement clock circuit. Cristal oscillator is more reliable for the high level output voltage. In this design the CPU which is used, has a clock cycle. Thus we use crystal oscillator and is pass through flip flop. Reset Circuit: After the power is supplied this circuit initializes CPU if Halt occurs. If the CPU is reset the execution starts. It will clear the interrupt. In this module two techniques are used linear select and fully decoding technique. In linear select each bit select a device, can be done with small system. Doesn’t need any decoding hardware, but it is time consuming. In fully decoding memory address is required to select memory device. Address Decoder: It tells about space in memory to allocate the address pointed by microprocessor. In this combinational circuits are used. It can enable multiple inputs. When all enables are active then only decoder has active low outputs. Display unit uses the decimal and hexadecimal format for displaying purpose. Z80 PIO: – It provides 8-bit I/O port. It needs a driver to fed output to 7-segment display. Whenever a vehicle crosses the gate, this unit send signal to driver. BCD to 7 segment decoder: – For displaying decimal digit, decoder is used to take 4-bit BCD input. Transistors are used to control opening of gate through motor. There is time interval of 10 seconds between opening and closing of gate. Diodes are used to protect transistor from reverse bias register to improve switching line. A DC Motor is used to control opening and closing of gate. Transformer: 220 or 240 transformer. Diode: converts AC current to DC. Filter Capacitor: used to reduce ripple voltage. 3. Compare sensor bit with entry code and exit code. By this system with the help of microcontroller gate project’s goal is achieved. The design can be applicable for any kind of system which needs sensor. In this system sensor plays the important part to this parking system. For effectiveness one should have the proper knowledge about the sensor, microprocessor, and assembly language. The sensor works effectively if operates in high intensity of light. This automatic gate can be used in organization; public car park etc. and this system don’t make for any security purpose. "Development of Microprocessor Based Automatic Gate." UKEssays.com. 11 2018. All Answers Ltd. 04 2019 <https://www.ukessays.com/essays/technology/development-microprocessor-based-automatic-4274.php?vref=1>. "Development of Microprocessor Based Automatic Gate." All Answers Ltd. ukessays.com, November 2018. Web. 20 April 2019. <https://www.ukessays.com/essays/technology/development-microprocessor-based-automatic-4274.php?vref=1>. UKEssays. November 2018. 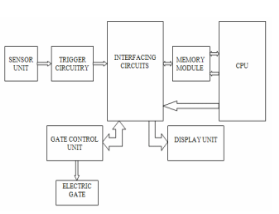 Development of Microprocessor Based Automatic Gate. [online]. Available from: https://www.ukessays.com/essays/technology/development-microprocessor-based-automatic-4274.php?vref=1 [Accessed 20 April 2019]. UKEssays. Development of Microprocessor Based Automatic Gate [Internet]. November 2018. [Accessed 20 April 2019]; Available from: https://www.ukessays.com/essays/technology/development-microprocessor-based-automatic-4274.php?vref=1.